Would you try the "Pizza Martini" on National Pizza Day? Circle Feb. 9 in your calendar. It's National Pizza Day, a time to celebrate one of America's favorite foods. In honor of the wonderful-but-unnecessary holiday, a Montgomery County restaurant is thinking outside the (pizza) box. Souderton's Northbound Restaurant, located in a former train station, will offer a very creative cocktail on Feb. 9. Guests can try the speciality, one-day-only pizza martini. 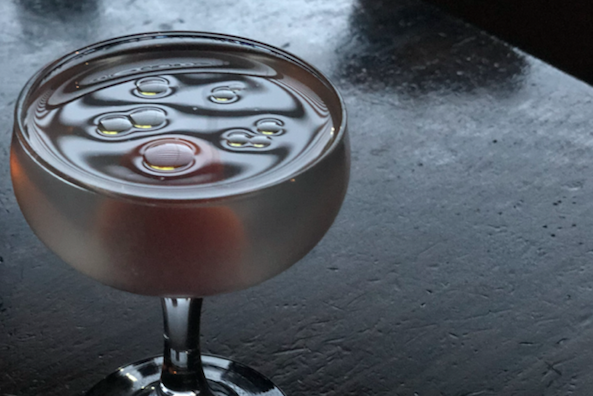 It's made with basil-infused Boardroom Spirits vodka, tomato and shallot water, pickled tomato and olive oil. The price is $11. Please, if you try this drink, let us know what it's like. Anyone who orders the pizza martini on National Pizza Day will receive 50-percent off a pizza. Options include cheese, pepperoni, vegetable and du jour. Regular price is $13-$14. The pizza of the day will feature garlic cream, caramelized onions and peppers, crispy fried prosciutto and will be topped with a balsamic reduction. Northbound's pies are Detroit-style, which means they're square, have a thick and crunchy focaccia-style crust with toppings and cheese baked into it, and sauce on top. The restaurant's address is 2 W. Broad St., Souderton, PA 18964.